The Waterdance is a 1992 drama written by Neal Jimenez, who also directed the film with Michael Steinberg. 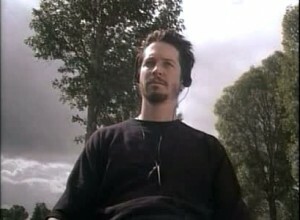 It premiered at the Sundance Film Festival in January 1992 and was released in theatres later that year, in May. The film was nominated for a bunch of awards, including the one for Best Casting for Feature Film from the Casting Society of America. It won the Independent Spirit Award for Best First Feature, the Audience Award and Waldo Salt Screenwriting Award at the 1992 Sundance festival, and the Gold Special Jury Award for Best Actors at the 1992 Houston WorldFest. 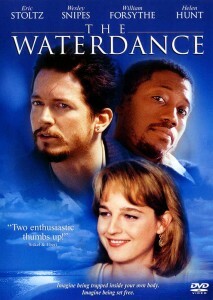 The Waterdance was released on DVD in December 2001. Author Joel Garcia breaks his neck while hiking, and finds himself in a rehab center with Raymond, an exaggerating ladies man, and Bloss, a racist biker. Considerable tension builds as each character tries to deal with his new found handicap and the problems that go with it, especially Joel, whose lover Anna is having as difficult a time as he is. As Raymond reveals a dream about dancing on the surface of a lake to stay afloat, it becomes apparent that each of them must find his own Waterdance to survive his tragedy. I first met directors Neal Jimenez and Mike Steinberg (absent from this piece because he’s prepping his next film Bodies Rest In Motion) at a rather upscale Mexican restaurant in Los Angeles. We were meeting to talk about The Waterdance, one of the best scripts I’d read in years. Whether or not I’d do the film was contingent upon a meeting, to see if we all had the same vision for the film and more importantly, to see if we got along with each other. We talked for a while about recent films we’d seen—and disagreed quite a bit, causing me to wonder who’d get stuck with the bill. First meetings are always a bit strained—but thankfully, Neal has a wonderfully sharp and biting wit. He made a few jokes. Unfortunately, they weren’t funny, but I’d read several of his scripts (River’s Edge, It Only Rains At Night) and knew him to be one of the most talented up and coming young writers around. As the dinner progressed, we loosened up and finally hit it off—leading to one of the most productive and gratifying work experiences I’ve had. And yes, I was stuck with the dinner bill. 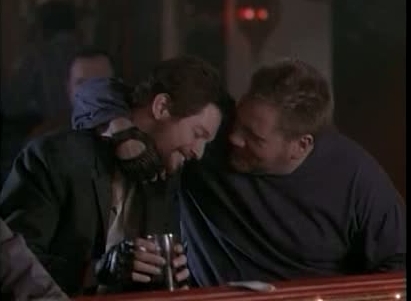 Being first time directors, Mike Steinberg and I saw every piece of film on Eric Stoltz (Mask,Memphis Belle, Some Kind of Wonderful, Manifesto, etc.) even though we had already met and hired him. It goes without saying—though Eric requires I do—that we knew we were working with a great actor. But one who had not yet quite played an adult on screen. The Waterdance afforded him this chance, and Mike and I were both overjoyed at his performance. He came to the editing room constantly, to bug us and give us suggestions. We owe him a debt. $85.47, to be exact. He is an actor of great sensitivity, passion, and dedication, and I’m sure we’ll stay in touch for the years to come. Or until he gets his money. Question: I thought that your performance as a quadriplegic was astounding. What did you do to prepare yourself for that role?